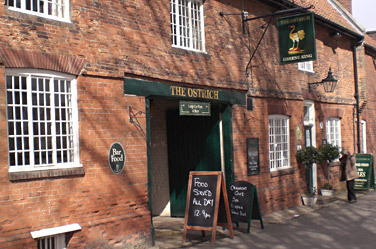 Visit the The Ostrich Inn website. Open all day. Large terrace and garden area. Play area. Bright friendly staff. Accommodation next door at The Pig Shed Motel, online bookings. 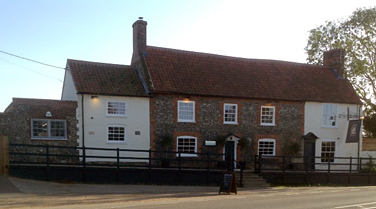 Varied food menu including steaks, fish, vegetarian/vegan and gluten free options. Roasts served on Sundays. Kids menu. Local ales including a gluten free Moongazer and Adnams Ghostship, low alcohol ales and lagers, wines by Lea and Sanderman, litre carafes! Afternoon cake and coffee, Birchalls teas, special hot chocolates with whipped cream and marshmallows, milk shakes.